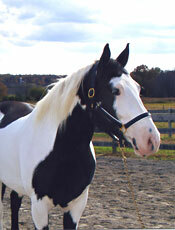 Spirit was one of ten Premarin or PMU foals rescued from Canada by Mylestone between 1998 and 2002. 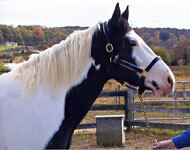 He had been legged down to New Jersey with the help of other equine rescues and arrived at the age of six months with four others in late 2001. All were treated immediately for shipping fever, and recovered well. He and his paddock mate, Grace, were unused to being handled and a bit on the wild side ... and that's how he got his name, Untamed Spirit. He was fortunate to be adopted by Sandi Cahill who had fallen in love with him. In May, 2007 he enjoyed his sixth birthday, and during that time he has done lots of groundwork to help his manners and prepare him to be ridden. Now under saddle, Spirit works with Sandi, the two making a great team together. 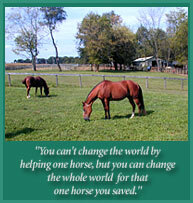 Read more on Spirit and Sandi.